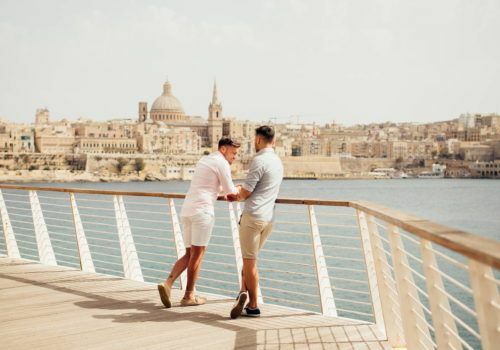 Discover the island of Malta on a luxury gay group trip. Malta is a tiny country but it’s packed with culture. There are temples that pre-date the pyramids of Giza by 1000 years. You’ll also find Roman cities and catacombs. In the Bible, it is written that Saint Paul once washed up on this island. The Order of Saint-John presided over Malta for 250 years. You’ll learn about their legacy, including the eight-pointed Maltese Cross, and you’ll see great paintings by Caravaggio that were commissioned by the knights. Malta has been voted the most gay-friendly country in Europe by the Rainbow Index. It’s a must-see destination. You’ll be transferred from the airport to our first hotel. In the evening you’ll get to know your fellow travellers over a welcome dinner. After breakfast we’ll set out on a mellow hike across in the countryside. We’ll then get a lift to Mnajdra Temple and Hagar Qim. These temples are so ancient they pre-date the pyramids of Giza by 1000 years. Later, we’ll head for a bike ride through the famous Blue Grotto. In the evening we’ll visit the 5000-year-old temple, Hypogeum. Only 10 visitors per hour are permitted. Malta’s capital, Valletta, is the 2018 European Capital Of Culture. We’ll see The Upper Barrakka Gardens as we stand on the Grand Harbour. We’ll also explore the Baroque Manoel Theater and watch a film about the island’s history. Over at the Hospital of the Knights of St. John, we’ll see an architectural masterpiece that embodies Malta’s fascinating history. We’ll have lunch at ‘Nenu the Baker’, perhaps the best restaurant in Malta. Then, we’ll visit Valletta’s National Library and see some of its great manuscripts. To top it off we’ll take an Upper Barrakka elevator ride to the old Customs House and take a private cruise down the Grand Harbour. In the morning we’ll learn how the famous pastizzi snack is made – we’ll then try some! We’ll also learn about local artisan traditions like lace-making. It has been a Maltese trade since the 16th-century. Next, we’ll enjoy a spot of wine tasting at the family-owned San Niklaw Estate winery. We’ll have lunch at Malta’s main fishing village, Marsaxlokk. Today we’ll head to the highest point of the island, the Dingli Cliffs. We’ll visit Misraħ Għar il-Kbir – known as Clapham Junction. Here we’ll find ancient tracks built around 2000 BC, perhaps designed to facilitate trade – the exact use of this ancient development remains a mystery. We’ll visit the Roman city of Melita. Its Citadel came to be known as Mdina and the rest of the area became Rabat. The city of Mdina is a fascinating combination of Medieval and Baroque architecture. For lunch, we’ll try straight-to-the-table ingredients at a local farm. Here we’ll meet Francesco, a local musician, and learn about Maltese music. Today we’ll set out on a quad bike ride along the island of Gozo. We’ll have a picnic on the way and try our hand at kayaking along the Maltese coastline. After exploring the island’s caves, we’ll have dinner at Xlendi Bay. After breakfast we’ll board the Allegra and set out on a private boat tour of the Mediterranean. We’ll have lunch on board as we sail the crystal clear waters. Today our Maltese adventure comes to a close. Say goodbye to your new friends and Malta – until next time.